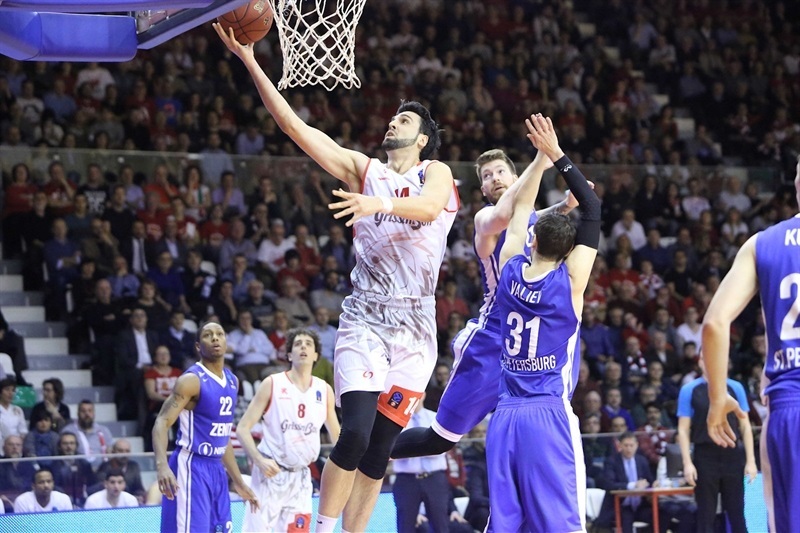 Grissin Bon Reggio Emilia will play in the 7DAYS EuroCup Semifinals for the first time in club history after outlasting Zenit St. Petersburg 105-99 at PalaBigi to win their best-of-three quarterfinals series. 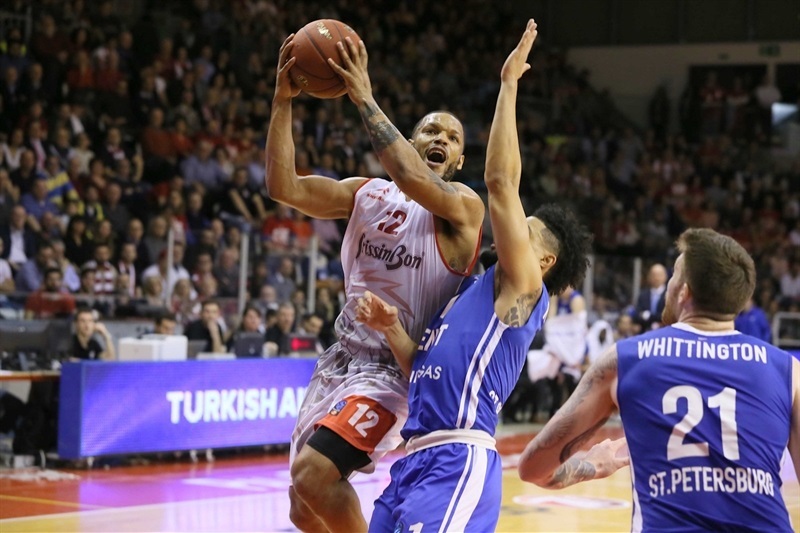 Reggio Emilia, which shattered its club scoring record by 12 points, tied Valencia Basket for the most points scored in a EuroCup quarterfinal game. The 204 combined points made it the highest-scoring quarterfinal game in competition history and the most points scored in any non-overtime elimination round game. Lokomotiv Kuban Krasnodar will be the opponent in the semifinals, which begin next week. Chris Wright paced the winners with a career-high 25 points plus 5 assists and 3 steals. 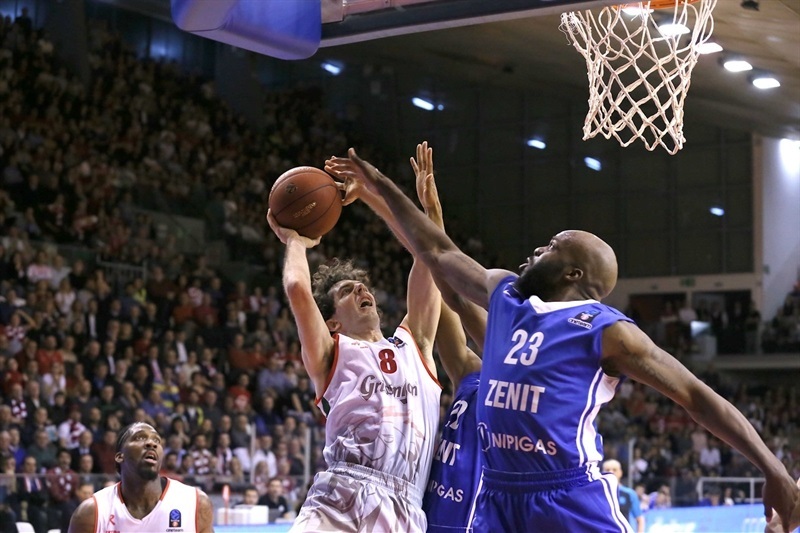 Julian Wright posted 21 points and Amedeo Della Valle netted 20. Jalen Reynolds added 10 points and 6 rebounds. 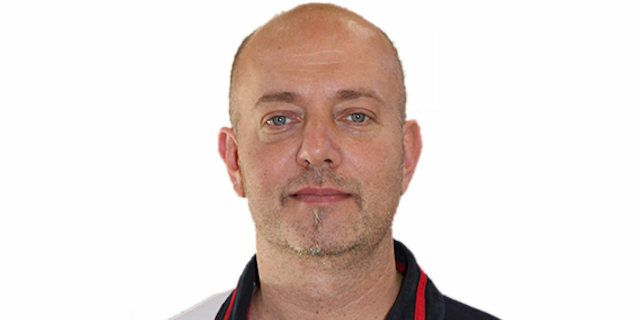 Reggio Emilia trailed by as many as 9 in the third quarter, but Chris Wright erupted for his own personal 8-0 run bridging the third and fourth quarters to give his team the lead for good and despite the best efforts of Top 16 MVP Kyle Kuric, Zenit could not get all the way back down the stretch. Evgeny Voronov led Zenit with a career-high 23 points, Kuric finished with 19 points and 7 rebounds, Marko Simonovic and Shayne Whittington added 15 points apiece and Malcolm Griffin added 11. 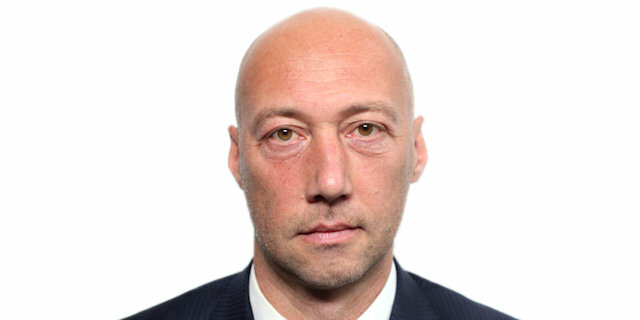 Zenit was without star swingman Sergey Karasev due to injury. Zenit took control early with strong defense, while Drew Gordon came off the bench to score 5 points in a 2-10 run that made it 6-15. James White drilled a three-pointer and Della Valle scored on the break to get the crowd back in the game. 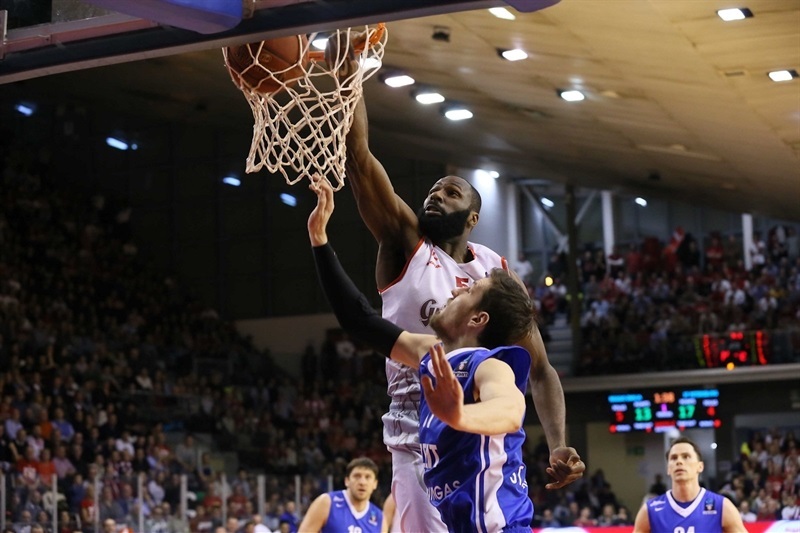 Julian Wright came alive for Reggio Emilia with a slam, a block and a spin move and bank shot to tie the game at 17-17. Reynolds finished on the break to put the hosts in front, but a three-point play by Voronov and a foul-line jumper by Griffin gave Zenit a 20-22 edge after 10 minutes. Reynolds scored the first two baskets of the second quarter before Kuric got on board for the visitors with a pair of free throws to knot the game at 24-24. Griffin was whistled for an unsportsmanlike foul on Della Valle in transition and that played a big role in a 12-0 run that created the game's first double-digit lead, 37-27. Simonovic ended a three-minute Zenit dry spell and Voronov threw in another to get the visitors going again. Gordon and Voronov each split free throws in the final minute of the half to close the gap to 45-40 at the break. Whittington's put-back and Voronov's layup and three-pointer saw Zenit take the lead just 90 seconds into the second half. Kuric stepped up for his first three-pointer of the night to make it 47-50. Chris Wright heated up and as the teams started to trade leads, on three occasions Chris Wright was the man to put the home team back ahead. However Voronov was just as good for Zenit. A three by Griffin made it 58-62. The arena fell silent as Griffin hit a jumper and Voronov turned a steal into a layup and a 59-68 lead. Gordon was called for a turnover and then a technical foul, after which Della Valle and Julian Wright free throws narrowed the gap to 4. Della Valle and Chris Wright added more free throws on the final two possessions of the third quarter to make it 70-71. Chris Wright opened the fourth quarter with a go-ahead jumper, a steal, offensive rebound and another two jumpers as Zenit called timeout at 76-71. 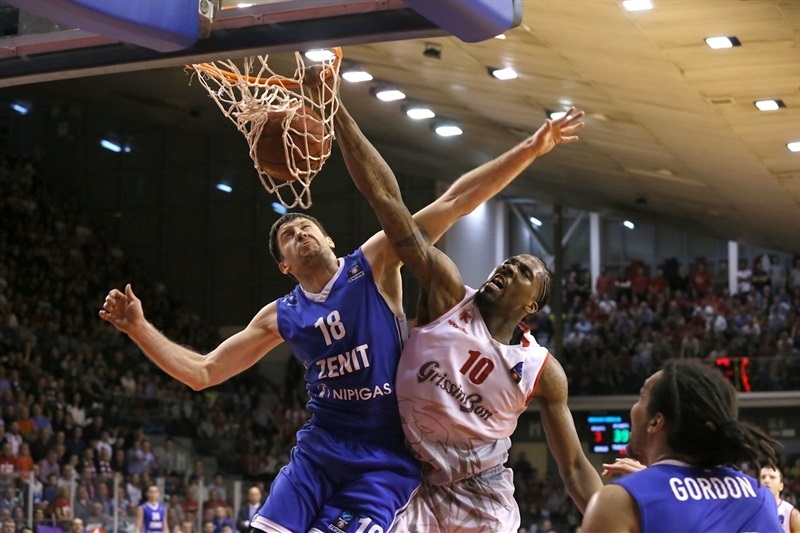 Gordon's put-back slam and Markoishvili's three-point play kept Zenit close. Griffin made it 82-81 with a floater in transition, but Riccardo Cervi’s slam and a Della Valle triple pushed the margin up to 6. A Voronov layup and Kuric three powered Zenit to 89-87 with four minutes to play. 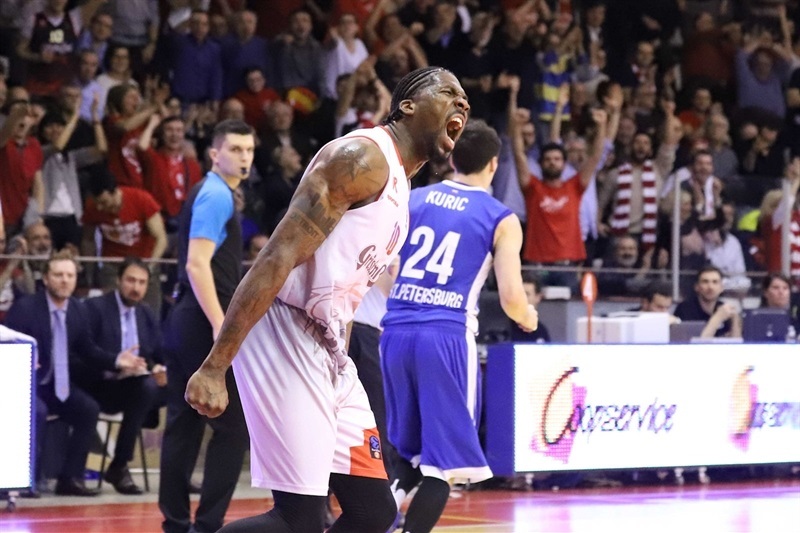 Cervi fouled out with 3:25 remaining, but Julian Wright's tip-in kept Reggio Emilia in control. White fouled out with 2:30 on the clock and Kuric free throws made it 93-90. 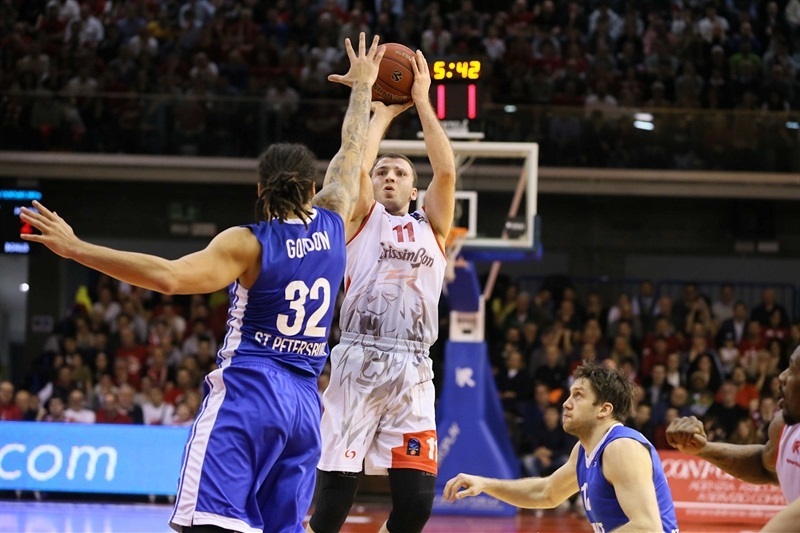 Della Valle nailed a step-back three-pointer, but Kuric answered with a three-point play. However Zenit cooled off at the worst time and Julian Wright’s layup with 27 seconds left made it a 6-point game, which despite the best efforts of Kuric, the visitors could not catch. "We played a war. 105-99 is exactly the opposite of what we expect out of our game, but we played with pride, so full of heart. We deserved this semifinal. It’s incredible, amazing. We deserve everything. We want to just enjoy this incredible night. We never give up. We were maybe at the beginning of the third quarter feeling the pressure, but we came back and I said to my guys that in this game, either they beat us by 20 or we have to win. And we won." "For three quarters it was a tie game and then we made too many turnovers without pressure and this is one of the reasons we lost the game."